Biomechanical studies using integrated screws with interbody spacer in lumbar spine have shown decreased torsional motion and more resistance to anterior displacement of the interbody device as compared to stand-alone cages that have been associated with suboptimal fusion rate in some studies. ,, In view of the equivocal need of anterior plating for single-level ACDF, with concerns for plating-related complications, there has been interest in the use of either stand-alone interbody cages, , use of anchoring clip,  or integrated fixation device  with interbody cage to ensure primary stabilization of the cage for cervical fusion. The oblique trajectory of the screws integrated with the interbody device traversing through the cortices adjoining the disc space provide strong fixation, obviating the need of anterior cervical plate. ,, Scholz et al. recently reported the use of polyether ether ketone (PEEK) cages filled with b-tricalcium phosphate with integrated screws in a selective group of patients, providing encouraging results. We have been using a similar device recently for the treatment of cervical degenerative disease, and the present study was conducted to review our clinical experience in a group of 16 patients with cervical degenerative disease. A retrospective chart review of patients who underwent ACDF, which involved placement of the anterior stand-alone device was conducted after obtaining institutional review board approval. A total of 20 levels were treated in 16 patients between June 2009 and November 2010 using the stand-alone device. Four patients had multi-level diseases and underwent two-level fusions each. All patients had symptomatic degenerative cervical spine disc disease between C3/C4 and C6/7 and failed non-operative treatment. 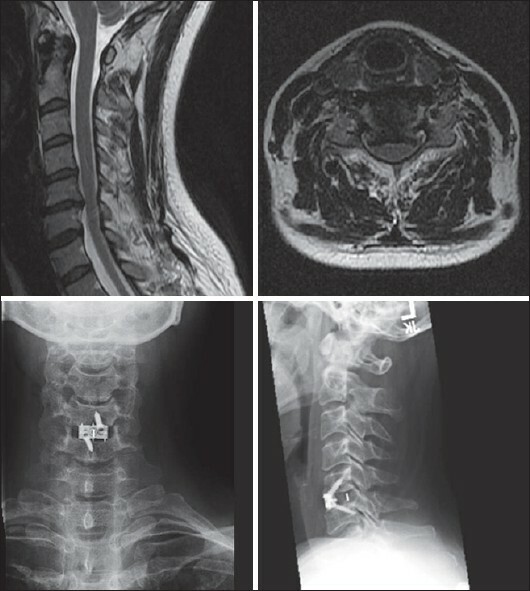 The indications for surgery were either radiculopathy or myelopathy with/without functional/neurologic deficit with good clinic-radiological correlation as confirmed by magnetic resonance imaging (MRI) with or without computed tomography (CT). Two patients had an associated diffuse idiopathic skeletal hyperostosis (DISH). One of the patients with severe DISH presented with severe dysphagia and required placement of gastrostomy tube due to severe difficulty in swallowing. Three patients had adjacent segment disease, two following previous fusion surgery and one with congenital Klippel-Feil disease. Degenerative disease was identified at the following levels: C3/4 (four), C4/5 (six), C5/6 (seven), and C6/7 (three). [Figure 1], [Figure 2] and [Figure 3] demonstrates the representative images of patients treated with the device in the present study. The patients were placed with a head extension in a supine position. To obtain the target disc space, a standard left side approach to the cervical spine was performed. A right-sided approach was used when necessary or in the presence of any contraindication to left-sided approach. After anterior decompression by the standard anterior cervical approach, trial spacers were used to determine the appropriate implant size. After the trial spacer was correctly fitted into the disc space, a corresponding stand-alone implant (COALITION; Globus Medical, Inc. Audubon, Pennsylvania, US) packed with b-tricalcium phosphate was inserted with an implant holder/aiming device. Correct position of the cage was ascertained using an image intensifier in lateral view. 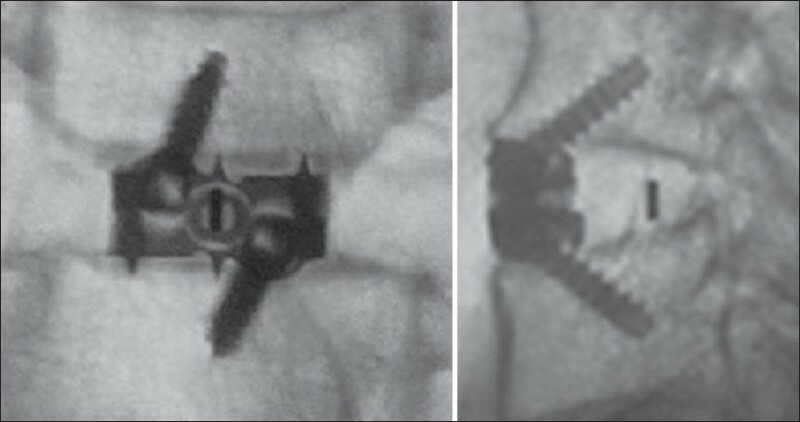 The device is made up of a PEEK body with tantalum markers along with a small plate containing two holes and internal screw treads [Figure 4]. After drilling the pilot hole through the aiming device, the first locking screw is inserted, followed by the second screw. The implant system contains screws of 14- and 16-mm length, which can be used depending on the overall bony anatomy of the patient. Due to anatomical obliquity, angled instruments for drilling, and inserting screws in the upper and lower may be required. No orthosis/collars were used in any of the patients. Standard physical therapy was initiated after 6 weeks of surgery. Follow-up data consisted of clinical and radiographic evaluation at regular intervals. Patient's pre-operative visual analog scale (VAS) score for neck and radicular arm pain on 0-10 scales, with 0 representing no pain and 10 representing severe pain was compared with that at last follow-up. Also, assessment of functional outcome using the Neck Disability Index (NDI) score ranging from 0% to 100%, with a lower percentage being indicative of a better condition was done before surgery and at last follow-up. Presence or absence of dysphagia was subjectively assessed by the senior surgeon (JO) and classified as none (no episodes of swallowing problems), mild (rare episodes of dysphagia), moderate (occasional swallowing difficulty with specific food), and severe (frequent difficulty swallowing with majority of food) after surgery and at last follow-up. Complications were recorded as implant-related, surgery-related, or general (not directly implant or surgery related). Neutral and F/E radiographs were evaluated by both the authors (JO and MK) to look for graft subsidence, implant failure, and status of fusion. Fusion was defined as the absence of radiolucencies, evidence of bridging trabecular bone within the fusion area, and no differences in angulation (<2°) or interspinous process distance (<2 mm) on F/E radiographs. The difference in VAS and NDI scores between pre-operative and at last follow-up was assessed using the t-test for paired samples and P < 0.05 was considered significant. Mean age of patients was 54 years (range: 38-84 years) with a male: female ratio of 1:3. Follow-up ranged from 6 to 12 months (mean: 10 months). The average operation time ranged from 119 ± 24 min with average blood loss being 88 ml (range: 30-150 ml). Average length of stay in the hospital was 1.4 days (range: 1-3 days). Before surgery, only 1 patient had complains of severe dysphagia, which required placement of gastrostomy tube for feeding [Figure 1]. In the early post-operative period, 2 of the 15 patients (13%) patients had mild dysphagia, which resolved during follow-up with no patient having complaints of dysphagia at 3-months follow-up. The patient with DISH and severe pre-operative dysphagia had significant improvement in swallowing function and came off his percutaneous endoscopic gastrostomy (PEG) tube at 3 months with stable swallowing at 1 year follow-up. Eighty percent of operated levels had some evidence of graft subsidence at follow-up on radiographic assessment. None of them had a subsidence >2 mm with the average graft subsidence being 1.1 mm (range: 0.4-2 mm). There was no evidence of any segmental collapse, graft migration, or detectable implant/screw loosening in any of the patients at last follow-up. All patients had a follow-up of ≥6 months and were assessed for presence or absence of fusion; 95% of operated levels (19 of 20 levels) were defined as fused and 93% of patients (15/16) achieved solid fusion [Figure 5]. One patient who had an adjacent segment disease following a prior two-level fusion in the past developed symptomatic pseudoarthrosis at 12-month follow-up and underwent revision surgery. There were no surgery-related complications. One patient each had transient left upper extremity proprioceptive changes and urinary retention that resolved within 24 hours without any long-term sequel. Analysis of follow-up VAS and NDI scores showed significant reduction in VAS score for neck pain (P < 0.019), radicular arm pain (P < 0.003), and NDI score (P < 0.007) in 77, 92, and 77% of patients at a mean follow-up of 10 months (6-12 months) [Figure 6] and [Figure 7]. Anterior cervical discectomy with interbody fusion is well accepted for the surgical management of radiculopathy or myelopathy secondary to degenerative cervical disc disorders. Recognition of donor site morbidity has led to use of numerous graft options for anterior cervical fusion. , In patients treated without the plate, additional complications can include graft extrusion, collapse, and failure of fusion, leading to kyphosis and pseudarthrosis. ,,, The use of graft options other than autograft has resulted in frequent use of plating even after single-level fusion in order to increase the fusion rate, decrease graft-related complications, and avoid post-operative orthotic use. In fact, as autograft/interbody cages have almost replaced use of autograft at most institutions in the United States, the use of anterior plate has become universal. Due to concern for decreased biomechanical stability of interbody cages, especially in flexion/extension,  and higher chances of subsidence of stand-alone cages reported in the literature with possible misalignment and pseudarthrosis, , there has been development of anterior cervical implant with screws integrated with the cage. The oblique trajectory of the screws associated with the integrated device engage the anterior cortex of the body and traverse through the strong cortices adjoining the disc space providing strong fixation, obviating the need of anterior cervical plate for a single and multi-level cervical fusion and was first described by Goel in 1997. Goel discussed a number of bicortical and tricortical combinations of using screws that employed the cortical surface adjoining the disc space. ,, There was no subsidence in the study using the zero profile device by Scholz et al. Similarly, though 80% of our cases showed some evidence of implant subsidence, none of our patients had a segmental collapse or subsidence of > 2 mm. 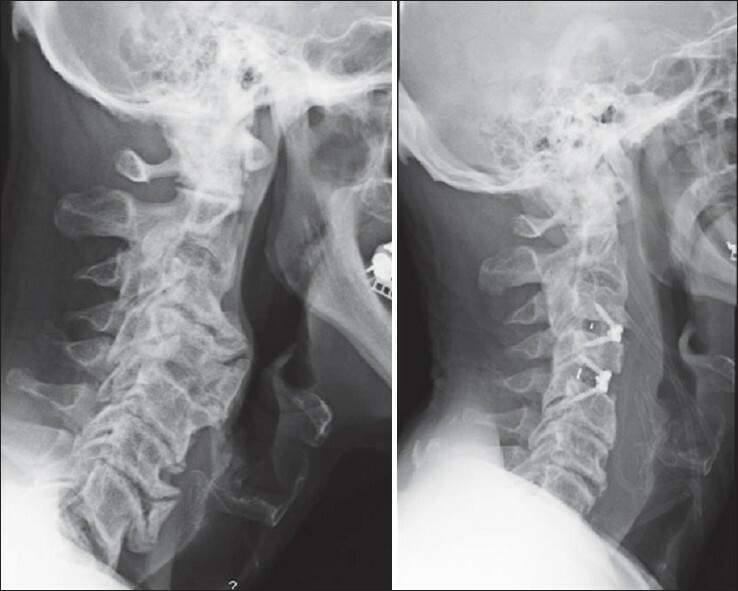 Subsidence may be of more clinical importance in treating multi-level cervical degenerative disease rather than in surgery for single-level fusion. Post-operative dysphagia after ACDF is a relatively common occurrence with a reported incidence of up to 70%, especially in early post-operative period. ,,, Jagannathan et al. reported a relatively lower incidence of dysphagia in their series of ACDF, without the use of any plating. 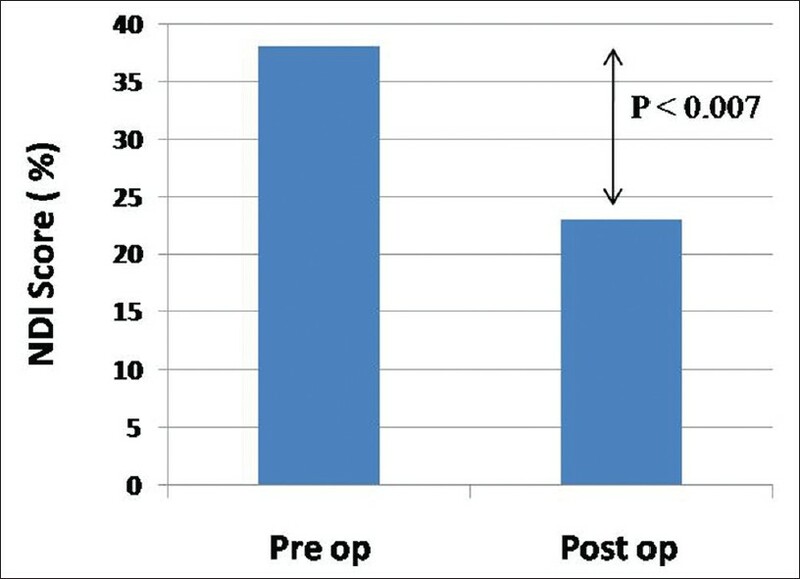 Only 9% patients had dysphagia in the post-operative period with only 3% of patients complaining of dysphagia at 3-month follow-up. We had very low incidence of early postoperative dysphagia (13%) with 0% incidence of dysphgia at 3 months. Similarly, Scholz et al. used a zero-profile device and reported a low incidence of dysphagia (3%) at 3-month follow-up. They however had very high incidence of early dysphagia (62%) in contrast to that in our study. Though the exact etiology of dysphagia after anterior cervical approach is unknown and multi-factorial, depending on the age of the patient, post-operative soft tissue edema, number of levels treated, esophageal injury, and post-operative hematoma, adhesions around cervical plates with plate prominence due to mechanical causes may be a contributing factor toward dysphagia. ,,,,, Lee et al. reported a lower incidence of dysphagia with use of thinner plates. The design of the implant used in the present study and also that reported by Scholz et al. reduces the implant contact with mechanical irritation to the soft tissue, explaining the lower incidence of dysphagia with the use of stand-alone device. Also, reduced soft tissue dissection associated with the use of this low profile implant may contribute toward decreased chances of dysphagia. 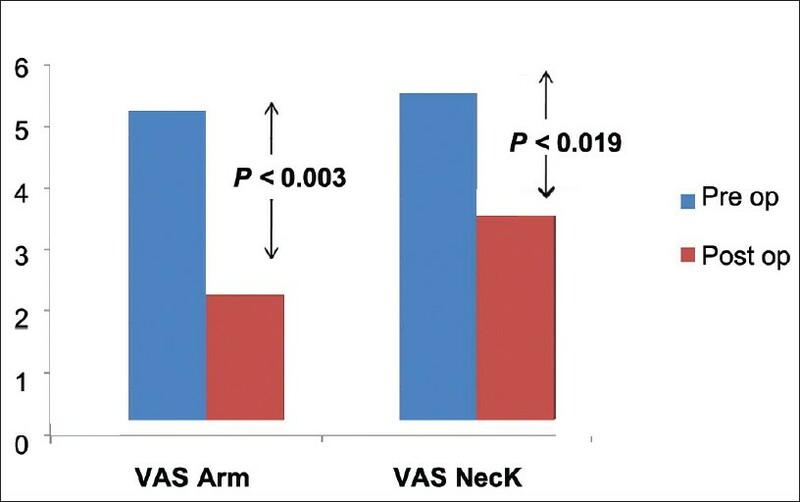 Most of the patients in our series had significant improvement in their VAS score for arm and neck pain and NDI scores [Figure 6] and [Figure 7] after discectomy and fusion using the integrated device, which is consistent with the results reported in the literature. The overall operative time, blood loss, and length of hospital stay using the integrated intervertebral implant was comparable to that in other studies. , Also, there is no learning curve as the standard Smith Robinson technique is very familiar to all spine surgeons. However, there are certain limitations to this study. First, the study was a retrospective one and depended on the data available in the medical records with retrospective assessment of dysphagia, which may have underestimated the true incidence. Second, the number of patients with variable diagnosis was small. However, the integrated intervertebral device described certain advantages. First, it requires less soft tissue dissection as compared to the standard cervical plating. Second, due to its low profile with location totally within the intervertebral disc space, the chances of dysphagia may be less and may be beneficial in patients who presents primarily with dysphagia due to severe DISH, reducing the theoretically risk of the plate acting as a mechanical cause for dysphagia. Also, treating skip level may be easier with the use of this device as was done in a couple of patients that would otherwise necessitate the use of longer cervical plates leading to more loss of normal mobility of the cervical spine. The less overall stiffness of the construct while preventing graft-related complications may lead to reduced chances of adjacent segment degeneration as compared to plating. Also, the use of a PEEK cage filled with b-tricalcium phosphate avoids complications associated with autograft harvest. To conclude, our preliminary results with the use of this cervical stand-alone anterior fusion device with integrated screw fixation shows its efficacy in anterior cervical decompression and fusion with stabilization with optimal clinical and radiographic outcome in a group of patients seen in the standard practice of a spine surgeon. Lower chances of dysphagia and no device-related complications with obviation of morbidly associated with autograft harvest are appealing, which needs to be verified in larger studies. 1. Jagannathan J, Shaffrey CI, Oskouian RJ, Dumont AS, Herrold C, Sansur CA, et al. 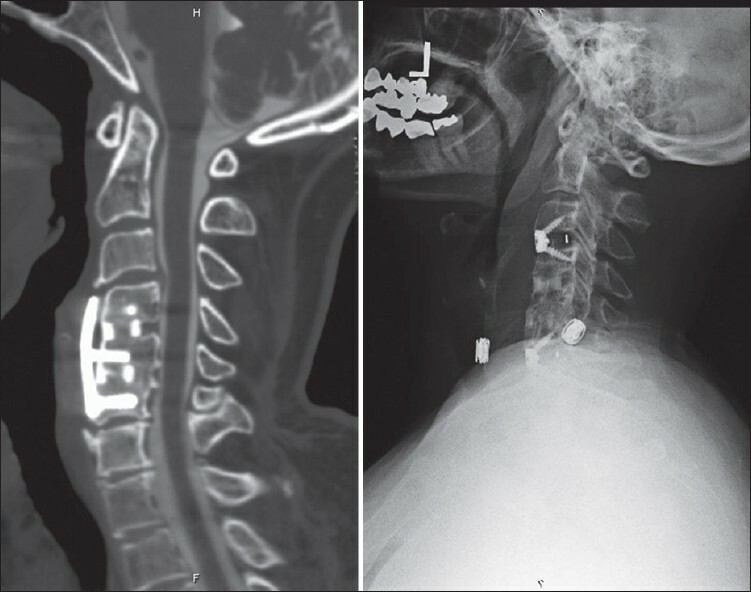 Radiographic and clinical outcomes following single-level anterior cervical discectomy and allograft fusion without plate placement or cervical collar. J Neurosurg Spine 2008;8:420-8. 2. Samartzis D, Shen FH, Lyon C, Phillips M, Goldberg EJ, An HS. Does rigid instrumentation increase the fusion rate in one-level anterior cervical discectomy and fusion? Spine J 2004;4:636-43. 3. Banwart JC, Asher MA, Hassanein RS. Iliac crest bone graft harvest donor site morbidity. A statistical evaluation. Spine (Phila Pa 1976) 1995;20:1055-60. 4. Chau AMT, Mobbs RJ. Bone graft substitutes in anterior cervical discectomy and fusion. Eur Spine J 2009;18:449-64. 5. Kaiser MG, Haid RW Jr., Subach BR, Barnes B, Rodts GE Jr. Anterior cervical plating enhances arthrodesis after discectomy and fusion with cortical allograft. Neurosurgery 2002;50:229-36. 6. Rihn JA, Kane J, Albert TJ, Vaccaro AR, Hilibrand AS. What is the incidence and severity of dysphagia after anterior cervical surgery? Clin Orthop Relat Res 2011;469:658-65. 7. Bazaz R, Lee MJ, Yoo JU. Incidence of dysphagia after anterior cervical spine surgery: A prospective study. Spine (Phila Pa 1976) 2002;27:2453-8. 8. Fujibayashi S, Shikata J, Kamiya N, Tanaka C. Missing anterior cervical plate and screws: A case report. Spine (Phila Pa 1976) 2000;25:2258-61. 9. Gazzeri R, Tamorri M, Faiola A, Gazzeri G. Delayed migration of a screw into the gastrointestinal tract after anterior cervical spine plating. Spine (Phila Pa 1976) 2008;33:E268-71. 10. Nourbakhsh A, Garges KJ. Esophageal perforation with a locking screw: A case report and review of the literature. Spine (Phila Pa 1976) 2007;32:E428-35. 11. Riley LH 3 rd , Skolasky RL, Albert TJ, Vaccaro AR, Heller JG. Dysphagia after anterior cervical decompression and fusion: Prevalence and risk factors from a longitudinal cohort study. Spine (Phila Pa 1976) 2005;30:2564-9. 12. Yue WM, Brodner W, Highland TR. Persistent swallowing and voice problems after anterior cervical discectomy and fusion with allograft and plating: A 5- to 11-year follow-up study. Eur Spine J 2005;14:677-82. 13. Beaubien BP, Freeman AL, Turner JL, Castro CA, Armstrong WD, Waugh LG, et al. Evaluation of a lumbar intervertebral spacer with integrated screws as a stand-alone fixation device. J Spinal Disord Tech 2010;23:351-8. 14. Li J, Dumonski ML, Liu Q, Lipman A, Hong J, Yang N, et al. A multicenter study to evaluate the safety and efficacy of a stand-alone anterior carbon I/F Cage for anterior lumbar interbody fusion: Two-year results from a Food and Drug Administration investigational device exemption clinical trial. Spine (Phila Pa 1976) 2010;35:E1564-70. 15. Sasso RC, Kitchel SH, Dawson EG. A prospective, randomized controlled clinical trial of anterior lumbar interbody fusion using a titanium cylindrical threaded fusion device. Spine (Phila Pa 1976) 2004;29:113-22. 16. Fujibayashi S, Neo M, Nakamura T. Stand-alone interbody cage versus anterior cervical plate for treatment of cervical disc herniation: Sequential changes in cage subsidence. J Clin Neurosci 2008;15:1017-22. 17. Gercek E, Arlet V, Delisle J, Marchesi D. Subsidence of stand-alone cervical cages in anterior interbody fusion: Warning. Eur Spine J 2003;12:513-6. 18. Zhou J, Xia Q, Dong J, Li X, Zhou X, Fang T, et al. Comparison of stand-alone polyetheretherketone cages and iliac crest autografts for the treatment of cervical degenerative disc diseases. Acta Neurochir (Wien) 2011;153:115-22. 19. Scholz M, Schnake KJ, Pingel A, Hoffman R, Kandziora F. A New Zero-profile Implant for Stand-alone Anterior Cervical Interbody Fusion. Clin Orthop Relat Res 2011;469:666-73. 20. Goel A. Alternative tricortical methods of screw implantation for anterior cervical plate fixation: A preliminary report. J Clin Neurosci 2000;7:134-6. 21. Goel A. Tricortical cervical inter-body screw fixation. J Postgrad Med 1997;43:4-7. 22. Goel A, Cacciola F. Anterior approaches for multilevel cervical spondylosis. In Alfredo Quinones-Hinjosa, editor. Schmidek and Sweet Operative Neurosurgical Techniques. 6th edition. Elsevier Saunders; 2012. pp.1789-1800. 23. Barsa P, Suchomel P. Factors affecting sagittal malalignment due to cage subsidence in standalone cage assisted anterior cervical fusion. Eur Spine J 2007;16:1395-400. 24. Dufour T, Huppert J, Louis C, Beaurain J, Stecken J, Aubourg L, et al. Radiological analysis of 37 segments in cervical spine implanted with a peek stand-alone device, with at least one year follow-up. Br J Neurosurg 2010;24:633-40. 25. Moon HJ, Kim JH, Kwon TH, Chung HS, Park YK. The effects of anterior cervical discectomy and fusion with stand-alone cages at two contiguous levels on cervical alignment and outcomes. Acta Neurochir (Wien) 2011;153:559-65. 26. Shimamoto N, Cunningham BW, Dmitriev AE, Minami A, McAfee PC. Biomechanical evaluation of stand-alone interbody fusion cages in the cervical spine. Spine (Phila Pa 1976) 2001;26:E432-6. 27. van Jonbergen HP, Spruit M, Anderson PG, Pavlov PW. Anterior cervical interbody fusion with a titanium box cage: Early radiological assessment of fusion and subsidence. Spine J 2005;5:645-9. 28. Chin KR, Eiszner JR, Adams SB Jr. Role of plate thickness as a cause of dysphagia after anterior cervical fusion. Spine (Phila Pa 1976) 2007;32:2585-90. 29. Lee MJ, Bazaz R, Furey CG, Yoo J. Influence of anterior cervical plate design on Dysphagia: A 2-year prospective longitudinal follow-up study. J Spinal Disord Tech 2005;18:406-9.